Located in the upper village, this condo has fantastic, direct ski-in/ski out access to 5 lifts (Ridge Rocket, Snow Ghost lifts, Plaza on the Ridge, Silver Bullet, Black Forest) and is close to Telus Terrain Park! It has a private hot tub on the front deck and the living room features a gas fireplace, TV and wireless internet. 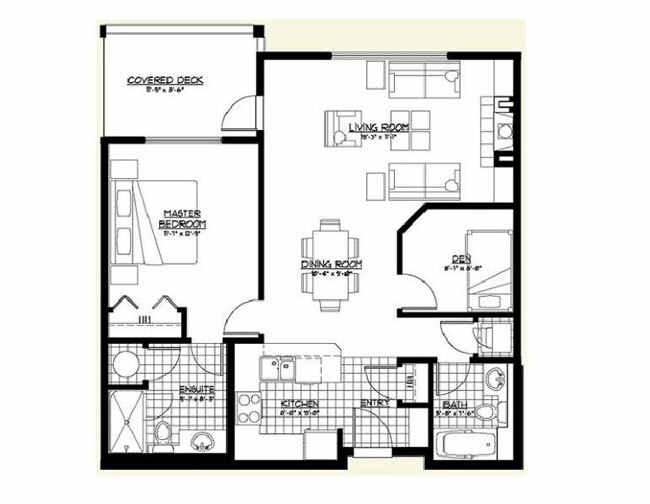 The kitchen, dining room and living rooms are all very open so families can socialize easily! The master bedroom has a queen bed and a En-suite Bathroom. The den has a double/single bunk. 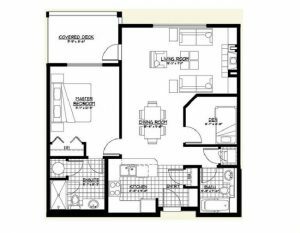 This condo can accommodate up to 5 people. The underground garage has one parking spot reserved to this unit. Ski in to the back of the Aspens Building 4 over the bridge, Aspens #301 is 1 floor down . Ski out from Aspens #301 take the elevator to the 4th floor, turn right then you will see the access door on your left. Skis and boards to be stored in the secure ski locker located down the hall to the right from Aspens #301. It is numbered 301. From the city of Kelowna (Hwy 97), turn South on Highway 33. Follow it for about 30 minutes (36 km) and watch for a blue sign that says “Big White Ski Resort” at the top of the long grade. Turn left on Big White Road and follow the road for about another 20 minutes (24km). You will pass a sign that says "Welcome to Big White". Continue past the sign for about 2.5 km and you will come to the village centre. To get to The Aspens, continue past the main village, bending to the right. Go past the Whitefoot Lodge and Mountain Mart and turn left at the T on Whiskey Jack. Turn right on Porcupine Road (Tamarack Inn is on the right) and continue up the hill. Go all the way to the top of the hill and when you come to the cul-de-sac, turn hard right into The Aspens entrance. You will turn into the very first garage door (parkade #4) on the left just after you turn right into Aspens. There is a keypad at the door, you will be given the code. The address is #4-301-7700, Porcupine Road.